Their seaside bungalow near Alki Beach provided the location for the girls getting ready while the guys were nearby too for their preparations. Time was managed beautifully and we had a moving first look in the woods of Lincoln Park followed by a generous amount of portrait time. 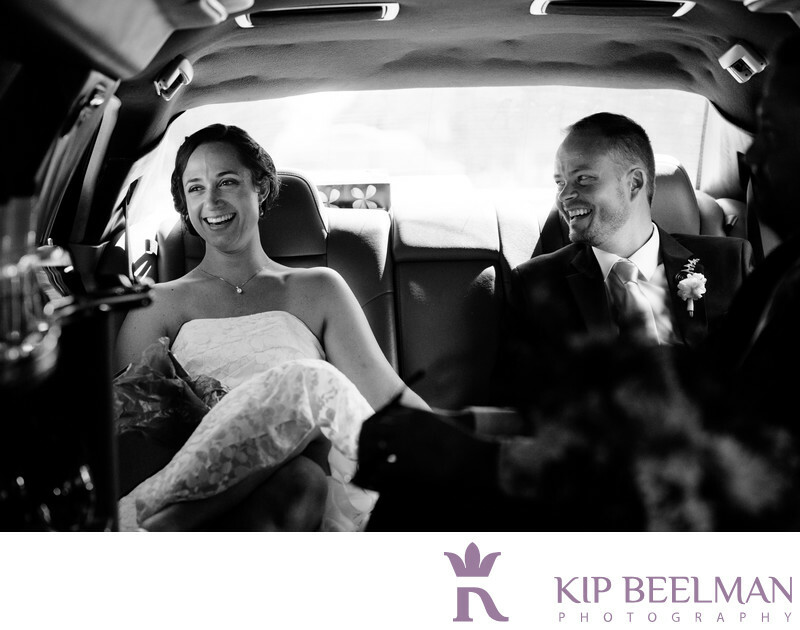 This frame was taken a few moments after when headed back to pick up the bridal party. I love quiet, simple moments like these and this was made with my 70-200mm lens as I was at the far end of the stretch limo, essentially in the dark, to remain unobtrusive. Photographing weddings at the Edgewater Hotel are always enjoyable and the rest of the day progressed wonderfully with buckets of sunshine, loving friends and family, tasty food and a perfect party. The officiating was handled by the fabulous Mary Calhoun and music was jammed by Jojo and DJ Tecumseh from the incomparable Bamboo Beats. The Edgewater is famous for the Beatles having stayed there and perhaps more infamous for some of the notorious antics of Led Zeppelin during their stay. The Beatles fishing Elliott Bay from the hotel windows is immortalized as an iconic photograph and in homage with the well appointed Beatles Suite at the hotel. Another favorite moment was sneaking with the bride and groom away to the rooftop of the nearby Bell Harbor Convention Center at sunset for taking in the spectacular downtown Seattle skyline, soft hues of the sky and beautiful Elliott Bay with some gorgeous frames for their collection. Location: 2411 Alaskan Way, Seattle, WA 98121. Keywords: Edgewater Hotel (3), Hotel Wedding (48), Seattle (111).